[prMac.com] Richmond, VA - FMWebschool, Inc., Announces their new book dedicated to FileMaker web publishing, "A Complete Guide to FileMaker Web Publishing with FMStudio". They will most likely say "No". Most FileMaker developers when asked have no idea how to create a FileMaker website. They would like to, but they fear the complexities and the time investments. The thought of learning another programming language is about as appealing as having a root canal. We have created another path that doesn't involve a trip to the dentist. Not being a natural programmer myself, I completely understand the struggle of learning new languages, especially those that are acronyms. Now the need to create dynamic websites is paramount. Simply put, information needs to be available 24/7 worldwide. Not just static data, but live, dynamic data that reflects changes instantly. You can accomplish this without the pain of learning a new language, here's how. We have created a tool that automatically writes the FileMaker compatible PHP code for you. We have also written a comprehensive 300+ page book that guides you through the complete process of bringing your FileMaker database to the web - without writing a single line of code. It sounds too good to be true, I know. Every two months we host a live webinar in front of our peers where we use FMStudio to build powerful FileMaker driven websites in less than 1 hour. I remind you, this is in front of a live audience of three to four hundred FileMaker developers. How do you get started? FMStudio enables you to connect Dreamweaver to FileMaker. Adobe Dreamweaver is one of the most popular cross platform web editors available. FMStudio enables you to see your FileMaker data, fields, layouts, tables, value lists, scripts and portals inside of Dreamweaver. Guess what, you can also drag and drop these fields right into the Dreamweaver work area and use our powerful wizards to build forms and tables populated with FileMaker data. We have written our new book to make the learning curve even faster. The complete guide is divided into three sections. The first section is a tutorial that guides you step-by-step towards creating a FileMaker web solution. The second section discusses expandable modules that help facilitate complex tasks such as instantly creating complex reports and complex emailing. The third section is a discussion of all the FMStudio features and how to implement them. This book is a tremendous guide and resource for any web developer. There is still a major problem however. There are not nearly enough competent FileMaker web developers to meet the demand. Over the past 9 years we have had the pleasure of creating and hosting FileMaker websites for clients around the world, but we cannot begin to put a dent in the demand. This long awaited book has something for everyone. Beginners will be able to follow along with the simple tutorials to create their first website. Intermediate and professional developers will be able to create powerful FileMaker websites with many complex features. Guess what, there are thousands of businesses, schools, and individuals that need access to dynamic data. FileMaker is the perfect solution. Get involved early, and benefit from the need for growing FileMaker web developers. 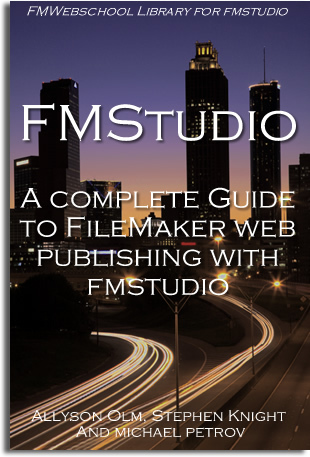 Our new book and FMStudio will enable you to begin creating FileMaker websites immediately! Get started today.